I try my very best to separate authors from their creations. That’s the purpose of storytelling, after all: to explore alternate personalities and perspectives. A story about an inherently racist protagonist does not mean its writer shares those views. A character that spouts political ideologies in stark contrast of my own isn’t indicative the author feels the same. And if the author does, well, the astute ones shroud their true beliefs, and don’t allow external stimuli to influence their work, or their readers’ opinions of it. After hearing Banville’s public degradation of my beloved genre, I stayed away from his Benjamin Black novels, despite favorable reviews. This is a crowded genre: I don’t need much of an excuse to overlook an author’s work. But when Banville was appointed by Raymond Chandler’s estate to write a new Philip Marlowe novel, I knew I’d break my promise. I’m still unsure why. Contemporary attempts to reinvigorate legendary characters have had mixed results in my mind. I enjoyed, but never loved, the John Gardner and Raymond Benson James Bond novels; appreciated Jeffery Deaver’s effort; and thought William Boyd’s recent SOLO was laudable, but lacked the panache of Fleming’s prose and plotting. Same goes for the latest installments in Robert B. Parker’s Spenser series; good novels, entertaining, but they never match the original works. But Chandler is the crème de la crème – – and Marlowe is the iconic hardboiled detective. Some authors might buckle under the strain of such an undertaking, and rightly so. Adapting Chandler’s prose; capturing Marlowe’s voice; these are novels that have been studied religiously for decades now. Readers of Banville / Black’s novel THE BLACK EYED BLONDE (a title left to waste by Chandler) will be scouring the text for inaccuracies. I certainly was. And when I was done – – a mere three days after reading its opening page – – I was left satisfied, impressed by the author’s resuscitation of Marlowe’s world, but pondering whether it was needed in the first place. After all, Chandler’s novels have proven they’ll resonate forever. THE BLACK EYED BLONDE begins with a woman, naturally. Clare Cavendish wanders into Marlowe’s office with a job for him. Her ex-lover is missing, and she wants him found. This begs the obvious question: why. But Marlowe is blinded by her beauty and accepts the job. The pace is plodding in the first 100 pages – – almost as though Banville / Black was finding his way into Marlowe’s world, desperately seeking traction and a hook to propel the narrative forward – – but when he finds his mojo, events spiral rapidly: murder, mayhem and torture abound as the plot snakes its way to a perfunctory conclusion. This is an absorbing rather than thrilling read; it’s not adrenaline spikes that will keep the pages turning, rather a complete immersion in 1950’s Los Angeles. Whatever my gripes about Banville / Black’s commentary on the genre, one cannot argue he’s a literary master and stylist. 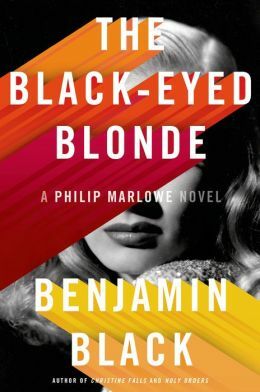 THE BLACK EYED BLONDE is an unessential entry in the Chandler canon. This is not doing the novel a disservice. Banville / Black has proven himself a capable impressionist – – and enticed me to check out his Quirke novels – – but this is a perpetuation of a character who doesn’t need a revival to remain relevant. Banville / Black doesn’t offer us anything we haven’t seen before – – imagine the uproar if he had! – – but because of these constraints, THE BLACK EYED BLONDE reads like an echo. There’s no doubt it possess resonances of Chandler’s brilliance, but plenty of other contemporary hardboiled fiction has done the same, without exploiting the Marlowe name.